We’d love your help. Let us know what’s wrong with this preview of Sold on a Monday by Kristina McMorris. For struggling reporter Ellis Reed, the gut From New York Times bestselling author Kristina McMorris comes another unforgettable novel inspired by a stunning piece of history. To ask other readers questions about Sold on a Monday, please sign up. I was so excited for this book and now I am finding it to be a bit slow and boring in some parts. However I am still on Part one. Did anyone else feel like this? Can anyone tell me if the story picks up? I love Kristina McMorris and think that she is still a talented author but I am not sure right now if I will finish this one. Mauri Baumann Unfortunately, the story does not pick up. I finished it....but although an interesting idea...it didn't deliver. I wound up skimming through the end. Would this boook be ok for grades 5-8? This new novel by MsMcMorris is every bit as heart wrenching and yet satisfying as her previous novel “The Edge of Lost”, also historical fiction. This book is set in 1931 during the depression when so many people lost everything they had, their jobs, homes, land, family and any means of making a living. As difficult as it is to imagine there were people who dropped their children off at churchs, orphanages, other relatives and, yes, even sold them when they could no longer feed or clothe them! When a struggling new reporter, Ellis Reed, comes across a sign on a house that reads “2 children for sale” he can’t believe that this can be true. He takes a photograph along with many others that he has been shooting throughout the countryside while trying to get an inspiration for a lead story. He talks with some of the neighborhood kids and his heart breaks for them. A secretary at the newspaper and friend, Lillian Palmer, sees the photo drying in the darkroom and is moved by it. Without Ellis knowing about it, she brings the photo to the Editor’s attention and there the ball gets rolling about whether this can be a feature story. Eventually Ellis gets the chance of a lifetime to write an article that will get widespread review and he has to make some very difficult decisions during this time. Should he expose these people to the humiliation of their hardship? Will he even get permission to print the photo? Will there be other photos needed to include with the story? Ellis as a character does a lot of growing in this story, first in a direction where he isn’t really comfortable but gets him much acclaim and then he changes course. Lillian Palmer is also a very well described character and her interactions with Ellis make each of them better people in the end. This is a very powerful story of a desperate time in our history. It will move you to tears but there is also laughter at times. Wonderfully developed characters, well described scenes of the times and beautiful flowing prose. Another 5* winner from McMorris, read it, you won’t be disappointed. I loved Kristina McMorris’s last book....”The Edge of Loss”....and this is another page turning Historical Fiction story- to love - based on a real photograph. Thought Provoking Quote —- at the start of Part 1 is so darn truthful! Kristina McMorris invites us into her storytelling with warmth and ease. I picture a reading welcome room .....with Kristina taking our coats, leading us to the most comfortable reading chairs made for human bodies. A small table with her book —and a cuppa hot tea. We, her readers, then sink comfy in our chairs and drift off to another time in history.....1931, Philadelphia and New York City. ..... The depression era. Food was scarce. People were desperate. Mothers sold their children — SOLD THEIR CHILDREN....that’s hard to digest. Why? Isn’t that the question? They were soooo poor — had sooooo little to give. Everyone needed to eat. It was a solution to the circumstances of the times. and follow their tale ......filled with loopholes — lies — regret—guilt — turmoil—doubts—and determination—leading to a very dramatic climax at the end. I think it was just last week when I read a review by Goodreads friend, Angela — that had me pause and ponder a question....”what makes a good work of Historical Fiction”? I hadn’t thought about it —one way or another. Well I’ve thought about more since then. ALL THE ELEMENTS THAT WORK about historical fiction books —Kristina McMorris covered remarkably. She had it all: the setting- characters - plot- conflicts - and themes. Her crafting kept us on our toes —moving in unexpected directions. Plus....we cared for her characters- I was rooting for Ellis and Lily. .....is it better for children to live with a family that can provide their basic needs with food, comfortable shelter and possibilities— or be with their mother who can ‘barely’ feed them and keep her own head above water? ....This story is also about values, beliefs, honor, ambitions, and redemption. As for Ruby and Calvin - ( the 2 children for sale) - they never left my thoughts .... two innocent young boys - shoeless - dirty with threadbare clothes. These little boys are sooo loved in our hearts — their quiet presence is always with us. I read Kristina McMorris’ last book, The Edge of Lost, the day my preorder arrived, which was the day before Thanksgiving 2015. I can remember that book on my counter a mere foot from where I was cooking. Any spare minute I had, the book was in my hands. It is one of the most perfect reads, and I have recommended it to many other happy readers since. When McMorris announced her new release, Sold on a Monday, I started counting the days. And the day finally came! Settling in to read a book by a favorite author; there is truly no better experience. Inspired by an actual newspaper photograph that spread like wildfire, Sold on a Monday is set during the depression. Times are dire, and a hard-working reporter, Ellis Reed, is trying to scope out a story so he can earn his meager salary. He takes a photo of two young boys, while not at first noticing the sign on the front of the house noting the children are for sale. The photo is a big break for Ellis, who has barely been making ends meet as a sometimes society reporter fill-in. He turns the photo into a period piece representing the ruthless and heartbreaking times brought about by the depression. The way it all unfolds causes Ellis to find his ethics questioned, and it snowballs into something bigger. Sold on a Monday is also Lily Palmer’s story. A young, unwed mother struggling to climb a ladder to somewhere with her job in a male-dominated profession (a male-dominated entire workforce, at the time), while also remaining employable period due to the stigma of her having a child out of wedlock. Working at the same paper, Lily befriends Ellis and becomes involved with his breakout story. Her own role as a mother further tests her ethics and pathos. McMorris knows how to write characters I absolutely love. Ellis and Lily each have a genuine goodness within them that is palpable and a strong drive to do what is right. Of course the children of the story are written with care, and even the once workaholic stereotypical reporter, Clayton Brauer, has a softer side. Sold on a Monday offered me a solid sense of what it was like to live in the 1930s, including the depression, the mob, prohibition, and the grim economic times. But more than that, it was about the alarming decisions people will make during desperate times. It is about right versus wrong and the search for understanding. It has mystery (a tiny cliffhanger at the end of most of chapters kept the suspense building), drama, and a sweet romance, all with helping children at its heart. For a book that had big shoes to fill, Sold on a Monday is revealing, powerful, and compassionate. Thank you to Sourcebooks Landmark for the complimentary copy. All opinions are my own. Sold on a Monday will be published on August 28, 2018! The sign sits on a porch in 1931. It's the time of broken dreams, lost fortunes and heartbreak. What a decision to make - to sell you children. This is the scene which journalist Ellis Reed comes upon while reporting on another story. He decides to take some pictures of the two boys sitting near the sign and wonders "can they read?" Do the boys know what is written on the sign? Heart wrenching and sad. Lilian Palmer is a single Mother who hides the fact that she has a four-year-old son who resides with her parents and whom she visits every weekend. By chance she sees the photograph that Ellis has taken and decides to bring it to her boss's attention. When that photograph becomes damaged, a new photograph must be taken. That final photograph changes things for both Ellis and Lilian (among other characters) forever. "Even decent, well meaning people could make poor choices under pressure." This book was a quick easy read but I found that the pacing lagged at times. I found it to be slow in the beginning, then picked up and then lagged again. My biggest complaint about this book is that even though the subject matter is heart breaking, I did not feel as if I had the emotional connection that I was expecting. I had high expectations for this book in that regard. Again, I was hoping for more of an emotional connection. Can you even imagine putting your children up for sale? What that must have felt like? The reasons and situation which led you to make such a gut-wrenching decision. What must it be like to know your parents are selling you? For the entire book I wanted to know what happened to those initial boys who sat by the sign on their front porch. Were they ever sold? What was their fate? The reader does not know as the story is no longer about them but about Ellis and Lilian and their quest to right a wrong they feel that they committed by taking the second photograph. I was also hoping for more POV's in this book so that I could feel more of an emotional bond with the other children, Ruby and Calvin and their Mother. For me, I wanted to know more about all the children in this book, their thoughts, feelings and emotions. Still, this is an enjoyable book which paints a picture of what life was like during that time. Tough decisions were made during that time which affected everyone in the family unit. Her characters were likable, and I did root for them. There are situations in this book which do pull at the heart strings. The story does become a tad predictable and everything is wrapped up nicely in the end but ultimately, I wanted more. Thank you to Sourcebooks Landmark and NetGalley who provided me with a copy of this book in exchange for an honest review. The thoughts and opinions expressed in this review are my own. I can’t stop thinking about the photographs - the cover of this book and the one that Ellis stages to support his piece for the newspaper he works for after his first photo is inadvertently destroyed, and the one in the author’s note that inspired her to write this book. I always love knowing the author’s inspiration for a story. But the one that haunts me the most is the first photo that Ellis takes, the one that is lost, the one that I only see in my imagination. The description of two little boys sitting on a porch with a sign next to them - “2 children for sale”. When I read about this first photograph and Ellis’s reaction “A breath caught in his throat”, it did in mine as well and was a truly visceral reaction for me. It’s a year after the stock market crash and a time when things are hard for people, but I shuddered to think - selling your children! I thought the story would be about these two little boys, their family, the impact of the Depression, but it turned out to be about two other children, and mostly about a man trying to make amends for a mistake he makes. It was a mistake that was committed through ambition and the need to prove himself to his father. The image of the two little boys on the porch was such a dramatic moment, I thought and then their story is gone. I did like some things about the book especially how Kristina McMorris depicts the time, the era with newsies on the streets yelling the headlines, elevator operators and copy boys and typewriters in the newsroom. I did connect with the two children, Ruby and Calvin who did become central to the plot, but still kept thinking about those two little boys wondering the whole time about their fate. There were a number of things covered here that are covered here . Being an unwed mother and the stigma that might have been attached to that in this time as well as the struggle of women to make a place for themselves as professionals in the work place were depicted well through the character of Lily. I didn’t, however, fully emotionally connect with Lily and Ellis’ relationship. Just too many threads and a pat ending which together diluted what could have been a meaningful story. Thanks to the those in the Traveling Sisters group who took part in the discussion. Always so interesting to get the perspective of others as we read and this was one we all seemed to agree on. Most of us studied it in school. Some of us listened to stories from our grandparents. Luckily, the Great Depression is something that none of us ever had to live through. We heard the stories of extreme poverty, vacant lots of cardboard boxes used for shelter, soup kitchens, worn out clothing, despair and dejection. Calvin Coolidge in 1932 said “in other periods of depression, it has always been possible to see some things which were solid and upon which you could base hope, but as I look abou Most of us studied it in school. Some of us listened to stories from our grandparents. Luckily, the Great Depression is something that none of us ever had to live through. We heard the stories of extreme poverty, vacant lots of cardboard boxes used for shelter, soup kitchens, worn out clothing, despair and dejection. None of us could fathom the idea of what it must’ve been like for a parent to “sell” their children because they didn’t have the money to feed them or even themselves. Kristina McNorris’ novel, sold on a Monday, is the fictional story of Ellis and Lily. It is the story that puts us the reader smack dab in 1931 during The great depression and the struggle of two individuals whose lives are forever in twined by one photo. Struggling for that one great story, reporter Ellis read heads out to the outskirts of Philly and sees it. The sign in front of a house that 2 children are for sale. This photo is the start of something big for society fill-in reporter, Ellis, as he writes a heart wrenching piece about the photo. Newspaper secretary, Lily Palmer, is the one that sees the photo and gives Ellis the soulful inspiration to write his career making story. She is moved by the photo because her own story she has to tell. McNorris’s novel reminds me of watching my grandmother crochet. I used to watch her take the yarn and ever so gently move It around her needle and then weave it Up and over until a beautiful blanket appeared. Sold on a Monday was mesmerizing to me that McNorris’s book was subtle in the way she wove the story. It started out with the photo and Ellis’s story but in the end was so much bigger than that. I won’t forget this journey that Kristina McNorris took me on in Sold on a Monday. I will think of it years from now, when as I get older and reminisce about all of the great books I was lucky enough to read, her book will be one that will bring a tear to my eye and a wistful smile to my face. 3.5 stars. Oh, that cover!!! If my rating were based on book cover alone, this would be a 5+ star! Perhaps due to my intense attraction to that heart-wrenching cover along with the book blurb, my expectations may have been set a little too high. With that stated, it was still an enjoyable story, just much lighter and different than expected. It simply didn’t ‘pack the punch’ (thank you, Marialyce) that I was hoping for. This novel follows Ellis Reed, a rookie employee in the newsroom who is tryin 3.5 stars. Oh, that cover!!! A big thank you to NetGalley, SOURCEBOOKS Landmark and Kristina McMorris for providing me with an ARC in exchange for an honest review!! 3.5 stars! First things first…...This is one of those books where I just had to read it because of that totally captivating cover and title of this book, which I found both to be absolutely intriguing! SOLD ON A MONDAY by KRISTINA MCMORRIS was definitely an interesting, heartbreaking but yet heartwarming, and haunting tale but it left me with some mixed feelings upon finishing though. I thought this book was a good, quiet, easy and quick read that definitely had some great aspects to it but it d 3.5 stars! First things first…...This is one of those books where I just had to read it because of that totally captivating cover and title of this book, which I found both to be absolutely intriguing! I still think this was a good book though and definitely worth the read but in my opinion it was a little too quiet in the delivery. Thank you so much to NetGalley, Sourcebooks Landmark and Kristina McMorris for the opportunity to read an advanced copy of the book in exchange for a review! 3.5 A picture speaks a thousand words, and it is a picture that will start Ellis on a journey of self discovery and moral questioning. Set against the Great Depression, this novel brings home the many things people had to do to survive. It is the children and a new picture that will bring Ellis his first success as a journalist, and that will bring Lily and Ellis together in a far reaching quest. It is the realistic atmosphere created, of a busy newsroom, of single mom trying to earn a living dur 3.5 A picture speaks a thousand words, and it is a picture that will start Ellis on a journey of self discovery and moral questioning. Set against the Great Depression, this novel brings home the many things people had to do to survive. It is the children and a new picture that will bring Ellis his first success as a journalist, and that will bring Lily and Ellis together in a far reaching quest. It is the realistic atmosphere created, of a busy newsroom, of single mom trying to earn a living during a time when unmarried women were not easily accepted, and of course the desperation of the times, that was my favorite part of this novel. Lily and Ellis are flawed characters, as these are usually the most interesting, and though I liked them, I wasn't really drawn into their stories. Just didn't feel the emotional connection that I usually feel with this authors books. The authors note with accompanying picture and story, did make an impression on me, especially since two of the children looked so much like mine when they were younger. So, I liked this book, the subject definitely deserves telling, but I didnt feel the connection that would make this one I loved. This was a sisters read and I think we all actually ended up in the same coulee, which doesn't happen often. Thanks ladies for the great discussion. ”Then I heard ‘Can you tell me how it all started?’ The reporter in my head blended with the detective before me. I wasn’t en !! NOW AVAILABLE !! ”Then I heard ‘Can you tell me how it all started?’ The reporter in my head blended with the detective before me. I wasn’t entirely sure which of them had asked. And yet, as if through a lens, I suddenly viewed the past year with astounding clarity, saw the interwoven paths that had delivered each of us here. Every step a domino essential to knocking over the next. With no small amount of regret, I nodded at him slowly, remembering as I replied. Imagine having no home. No income. No hope. And as far as you can see, those around you are either in the same boat, or on their way there, struggling to hold onto what little they have that they can claim as theirs. Imagine hearing your children cry every night because there isn’t enough food for them, their threadbare, ratty clothes no longer fit because there is no money for new clothes and there hasn’t been in too long to remember. No one has any money. You can’t, really picture this unless you’ve lived through it, I suppose. Endless desperation with no reason for hope. Set in 1931, it’s August in Laurel Township, Pennsylvania when Ellis Reed first sees the two boys, no shoes, no shirts, pitching pebbles at tin cans in their overalls. He’d taken his camera along for scenic shots, but the eyes of the boys drew him in. Icy blue. As he focuses on the boys, a sign made from a wooden slat, the edges all jagged, comes into focus as well. Ellis’s was responsible for providing readers with the latest “fluff” for the Society page of the Philadelphia Examiner. It wasn’t what he wanted to do, but it was what he did, so he was always hoping, looking for that something to prove he could cover the big stories, to get his big chance. Even though he had used the paper’s camera to take the shot, he took it more for the story it told, a story without words, never intending another to see it. Lillian Palmer also works at the same newspaper, as a secretary, although she has aspirations of becoming a writer. Lillian sees the photograph Ellis has taken and convinces him to turn it in for the newspaper. An accident occurs with the original photograph, and he’s forced to reshoot the scene with Ruby and Calvin. What follows once it is published is the heart and soul of this story. I remember when I was really young, too young to understand what I’d been told, that the woman who had been visiting my grandparents wasn’t really my father’s sister, and her daughter wasn’t really my cousin, but she had come to live with them when her parents were too poor to afford food during this the 1930s. I don’t know the ins and outs of this, and I really only found out because my mother wanted to make sure I didn’t think that we were related. When I found out that my grandparents took them in, it made no sense to me. My grandparents were poor, so I didn’t understand why they would take in another mouth to feed, but they did. This was the reason I decided that I wanted to read this story. This is a story of desperation born of the circumstances of the Great Depression. One of the many ways that era left lifelong emotional scars on those most affected. This is less about the era than it is about the way it affected this one family, and the people who came to their aide when needed. There is a little romance in this story, but this story is really about what people can be driven to in times of desperation, the values to which we hold ourselves, and the need to rectify wrongs. We were immediately drawn into the story with the photo of the “2 Children For Sale” We were intrigued by the photo and the story it held. The children in the photo pulled at our heartstrings and we wanted to know more about them. However, that was not the story told here. The story takes a different turn and becomes about two other children and our main character quest to Norma, Lindsay and I read Sold on a Monday with five of our Traveling Sisters and we all had similar thoughts on this story. I think that had we known the story was inspired by the photo and not about the children in the photo we might have enjoyed the story more. This is probably one we shouldn't of went in blind with. Even though we had our issues with this one we still highly recommend this story for readers looking for a lighter story with some drama. Thank you to NetGalley, Sourcebooks, and Kristina McMorris for a copy to read and review. This historical novel is based on a real photograph snapped (possibly staged) during 1948 by a news reporter. McMorris takes that idea and transports it back to the Depression. I was expecting something along the lines of Orphan Train, but I was off track there. In fact, the children are mere devices to get the story going and don’t figure prominently again until it’s over halfway done. McMorris does some things very well. The tension between Ellis and his father felt spot on. And the love and w This historical novel is based on a real photograph snapped (possibly staged) during 1948 by a news reporter. McMorris takes that idea and transports it back to the Depression. I was expecting something along the lines of Orphan Train, but I was off track there. In fact, the children are mere devices to get the story going and don’t figure prominently again until it’s over halfway done. McMorris does some things very well. The tension between Ellis and his father felt spot on. And the love and willingness of a parent to move heaven and earth for a child. In fact, where the book does best is when it deals with the ethics of the choices made by all the various adults. To me, the best historical fiction evokes enough of the time and place to teach me something. This fails in that regard. That doesn’t mean the book is bad. It just means if you go in expecting to learn something new about the depression, you’ll be disappointed. She gets the details right, but this ground has all been covered before. And the writing seemed two dimensional. Despite how heartbreaking the story is, I couldn’t connect with it. In trying to decide why that is, I can only surmise that it’s because the story is more about Ellis and Lillian. When it comes down to it, this is more romance novel than historical fiction. My thanks to netgalley and Sourcebooks for an advance copy of this novel. EXCERPT: Another drop of sweat slid from Ellis's fedora, down his neck, and into his starched collar. Even without his suit jacket, his whole shirt clung from the damn humidity. He moved closer to the house and raised his camera. Natural scenic shots were his usual hobby, but he adjusted the lens to bring the kids into focus. With them came a sign. A raw, wooden slat with jagged edges, it bowed slightly against the porch, as if reclining under the weight of the afternoon heat. The offer it bore, EXCERPT: Another drop of sweat slid from Ellis's fedora, down his neck, and into his starched collar. Even without his suit jacket, his whole shirt clung from the damn humidity. He moved closer to the house and raised his camera. Natural scenic shots were his usual hobby, but he adjusted the lens to bring the kids into focus. With them came a sign. A raw, wooden slat with jagged edges, it bowed slightly against the porch, as if reclining under the weight of the afternoon heat. The offer it bore, scrawled in charcoal, didn't fully register until Ellis snapped the photo. ABOUT THIS BOOK: From New York Times bestselling author Kristina McMorris comes another unforgettable novel inspired by a stunning piece of history. MY THOUGHTS: This is a quietly powerful novel. It is not written in a dramatic fashion, yet it tore my emotions to pieces. It gave me everything I expected, and more, yet it was nothing like I expected. None of us know what is in the hearts and minds of others. We are quick to judge by appearances, seldom taking the time to dig beneath the surface to determine the truth. And we do things ourselves, sometimes with the best of intentions, sometimes to further our own interests, mostly without thinking through the consequences. This is just what Ellis and Lily do. They individually set in motion a chain of events that neither one of them could have imagined and, united in the aftermath, what they find is not what they expected. After the initial photograph of the children and it's accompanying furor, the book focuses largely on Ellis's career. I kept thinking, 'The children. . . what is happening to the children?' I was beginning to think that the book wasn't about them at all, that it was just an attention grabbing stunt. But I was wrong. The author was making a point, and a very good one, about how easy it is to lose sight of what is important, to be blinded by other things, superficial things that, easily gained, are also easy to lose. This book is largely about values, about being true to ourselves and our beliefs, about truth and compassion, choices and consequences. But don't go thinking it is at all preachy or moralistic, because it's not. It is a beautifully written, compelling and captivating slice of history that will tug at your heartstrings. But it did leave me with one burning question. . . what happened to the two little boys in the first photo that Ellis took? That haunts me still. I feel sure that this book is destined to become a classic. THE AUTHOR: KRISTINA MCMORRIS is a New York Times and USA Today bestselling author. Her novels have garnered more than two dozen literary awards and nominations, including the IMPAC Dublin Literary Award, RWA’s RITA® Award, and a Goodreads Choice Award for Best Historical Fiction. Inspired by true personal and historical accounts, her works of fiction have been published by Penguin Random House, HarperCollins, and Kensington Books. Her forthcoming novel, Sold on a Monday (Sourcebooks Landmark, 8-28-18), follows her widely praised The Edge of Lost, The Pieces We Keep, Bridge of Scarlet Leaves, and Letters from Home. Additionally, her novellas are featured in the anthologies A Winter Wonderland and Grand Central. Prior to her writing career, Kristina hosted weekly TV shows since age nine, including an Emmy® Award-winning program, and has been named one of Portland's "40 Under 40" by The Business Journal. She lives with her husband and two sons in the Pacific Northwest, where she is working on her next novel. DISCLOSURE: Thank you to Sourcebooks Landmark for providing a digital ARC of Sold On A Monday by Kristina McMorris for review. All opinions expressed in this review are entirely my own personal opinions. Please refer to my Goodreads.com profile page or the about page on sandysbookaday.wordpress.com for an explanation of my rating system. Set in 1931 when desperation and poverty abounded the heartbreaking story of how actions have many consequences and not always for the good. It all started with a photograph of two children sat underneath a sign that said for sale which altered the lives of the mother, children and the photographer who took the image. Totally gripping story that I really enjoyed. A Goodreads friend had introduced me to Kristina McMorris’s works awhile back ago and I even added a few of her books to my TBR at the time, but unfortunately never got around to reading them – so when I found out that McMorris would have a new book out in August, I immediately requested an ARC (and happily got approved right away). Even without that though, taking one look at the cover made me already want to read this book. Honestly, who wouldn’t be moved even a little bit seeing a little boy A Goodreads friend had introduced me to Kristina McMorris’s works awhile back ago and I even added a few of her books to my TBR at the time, but unfortunately never got around to reading them – so when I found out that McMorris would have a new book out in August, I immediately requested an ARC (and happily got approved right away). Even without that though, taking one look at the cover made me already want to read this book. Honestly, who wouldn’t be moved even a little bit seeing a little boy on the cover, seated on the grassy floor, his head down, arms over his knees, waiting all by himself with a lone suitcase by his side, the title Sold on a Monday written right above him? As the saying goes, pictures speak a thousand words, and that cover picture, along with the ones described in the book (as well as the original picture in the Author’s Note which McMorris explains actually inspired this story), are ones I can’t stop thinking about. I don’t have any kids of my own, but I have an 8-year-old nephew whom I adore and absolutely can’t imagine living without, so it is unfathomable to me to think that a parent (or parents) could sell their children so willingly, regardless of the situation. Looking at those pictures, I was curious and wanted to know more – yes, I wanted to know the story behind the pictures, but beyond that, I wanted an explanation, one that would help me understand the heartbreaking scene in the photographs. Going into this book with these pre-conceived thoughts, I was expecting the story to be deeply emotional, despite the fact that I already knew this wouldn’t be the “real” story behind the original photograph, but rather a fictionalized version based on McMorris’s own research and interpretation. Set in the early 1930s in Pennsylvania and later New York, against the backdrop of the Great Depression and its after effects, we follow society reporter Ellis Reed as he tries to scope out a satisfying story to earn his keep at the local newspaper he works for. While on assignment, he snaps a photo of two boys next to a slightly rundown house and only later notices the sign in front that says ‘2 children for sale’. It is this photograph that becomes the catalyst for the entire story, putting Ellis on a path of events that unfold in the most unexpected of ways. By his side is Lily Palmer, a young mother working as a secretary to the chief at the same noticeably male-dominated newspaper – she befriends Ellis and eventually becomes involved in his story after the haunting image of the children being put up for sale in the photograph triggers memories of her own past. I was captivated with this story from the start. Compelling and well-written, this story is not simply about Ellis getting his big break in the cutthroat world of a fast-paced and often unforgiving newspaper outlet, nor is it simply about Lily’s struggle as an unwed mother who is trying to rise above society conventions and make a life for herself as well as her child. The story is more complex and through the fate of the children, leads us to an exploration of morality and ethics in journalism, but more importantly, pushes us to think about our own perceptions and biases as well as our natural tendency to judge others and at times formulate a quick opinion based on limited knowledge. McMorris did a really great job with the historical aspects of this story, with establishing time and place and relaying with vivid detail various aspects of the newsroom environment, as well as what was going on in society as a whole during that era. I also liked that McMorris tried to incorporate an element of suspense by ending each chapter with a cliffhanger of sorts, which kept me as a reader engaged and continuously turning the pages in an effort to find out what happens next and the eventual fates of the children at the center of the story – Calvin and Ruby – both of whom captured my heart from the beginning. Character-wise, both Ellis and Lily were well-drawn and were characters that I liked as well as rooted for – however for some reason, I found it difficult to connect with either character on an emotional level, which bothered me a bit. Perhaps I was just never convinced about Ellis and Lily’s relationship from the getgo, plus my focus from the beginning was on the story of the children, so the romantic element that was added, though not overwhelming, did become a little bit of a distraction. Therefore, while I enjoyed this book overall and it was a good as well as necessary read for me, I didn’t “love” it the way I thought I would. Though this was my first time reading Kristina McMorris’s work, it certainly won’t be my last. I am definitely looking forward to reading the rest of her books at some point down the line, hopefully sooner rather than later. I started reading Sold on a Monday on 9/9/2018 and finished it on 9/24/2018 at 12:30am. This book is a marvelous read! I like that every chapter ends with suspense and mystery. I like following Ellis, experiencing through his struggles with his career and the unstable relationship with his dad. It feels real and can be relatable to many readers. I also like following Lily’s perspective. She’s really mature for her age and it’s from the lesson she learned by a mistake she made when she was young. I started reading Sold on a Monday on 9/9/2018 and finished it on 9/24/2018 at 12:30am. This book is a marvelous read! I like that every chapter ends with suspense and mystery. I like following Ellis, experiencing through his struggles with his career and the unstable relationship with his dad. It feels real and can be relatable to many readers. I also like following Lily’s perspective. She’s really mature for her age and it’s from the lesson she learned by a mistake she made when she was young. I like her loving family and her supportive parents. I like when Ellis and Lily’s path crossed and the adventures they took to reunite a family. This book is told in the third person point of view following Ellis Reed, a journalist for the Philadelphia Examiner who captured a picture of two boys with the children for sale sign. His article brought to light the struggles of the economy after the market crash in 1929. His article affected not only the readers but also Ellis’ career. The second third person point of view is Lily Palmer, 22, the chief’s secretary at the Philadelphia Examiner who handed Ellis’ picture to the chief. The picture of the boys reminded Ellis of his lost sibling and Lily of her secret. One day when Ellis was directed to follow up with the children from his article, he didn’t expect to find the devastating news. Because the article affected both Ellis and Lily, they race to unravel the mystery of the kids and their mom. Sold on a Monday is very well written and developed. I love the plot and the unexpected twists. Child labor is a heart breaking read as well as the story of Calvin. This book has a slow burning romance that is great to read. I like learning about life in 1931, especially the value of money during that time. I love the ending and cry like a baby. That bit with the mafia sure got my heart racing. This book is definitely a couldn’t put down read and I highly recommend everyone to read it. ***Disclaimer: I won a copy of Sold on a Monday from a Goodreads giveaway hosted by the publisher. Many thanks to Sourcebooks for the opportunity to read and review. Please be assured that my opinions are honest. Ellis works with Lily, a woman who works at his paper as a secretary, her dreams of becoming the next Nellie Bly (one of the first female journalists to make a name for herself in the then-all-male world of journalists) seem to be just that—far off, never-attainable fantasies. They work together to find out what happened to the children in the picture and remedy any wrongs. This is a highly readable, fast-paced novel. Recommend. Thanks so much to NetGalley and Sourcebooks for the opportunity to review this novel. You know book lovers that feeling you get when you see a cover and a blurb about a book and you know in your head that you just have to read it? Perhaps it is the anticipation, the wanting for this book to be spectacular, the need to read it from start to finish that propels you. Perhaps also it is this anticipation, that sets higher goals then this book is able to reach and sadly this was the case for me with Sold On A Monday. A "want to be" newspaper reporter sees a sad sight and snaps a photo. Later, it is believed that he has a gem of an idea for a story, a story that might propel him into the position at the paper he so desires. The sign is that of two young boys sitting on a porch. They are being sold, a result of the effects of the depression where life became so onerous for Americans that a sight such as this tragically happened. The reporter, Ellis Reed returns to find these boys and sees the house deserted and the children gone. So Ellis stages a photograph using two other children and from this the photograph a story and tragic events ensues. The children in the second photo are gone, sold......Ellis must find them and what happened to these young children. He is joined on this journey by Lillian Palmer, a young woman also looking for a way to better herself and follow in the footsteps of Nelly Bly. Lillian herself carries a secret and she an Ellis search for these children following quite a circuitous trail to their possible whereabouts. Their search leads to heartbreak for the mother of the children of the staged photo. This book has such an excellent premise and I was hopeful that it would provide an excellent story. However, sadly, I was disappointed. I felt a lack of a connection with the characters, as the book seemed to lack that emotional tie so needed in a book of this sort. There was just not that punch I felt this book required, although the author did a fine job with her descriptions. I enjoyed her author's note about the 1948 photo which inspired this book. I wished so much that she had followed up with that photo with its tragic story instead. This was a quick read, one that I read with a group, The Traveling Sisters on goodreads. We each came away feeling the same way about this story. Thank you to Kristina McMorris, Source Books Landmark, and NetGalley for an advanced copy o this book. The picture that inspired the story. Siblings shown in old photo tell their stories and the article about it. It all started with a photograph - two little boys next to a sign saying '2 children for sale' during the depression of the 1930s. The photographer, Ellis Reed, a young journalist who liked to take photos, hadn't thought to make a story out of it until Lily, a secretary in the newsroom saw it in the darkroom and showed it to his editor. When the photograph is accidently damaged, Ellis makes the choice to stage a replacement with two other children, rather than to lose the article that he knows c It all started with a photograph - two little boys next to a sign saying '2 children for sale' during the depression of the 1930s. The photographer, Ellis Reed, a young journalist who liked to take photos, hadn't thought to make a story out of it until Lily, a secretary in the newsroom saw it in the darkroom and showed it to his editor. When the photograph is accidently damaged, Ellis makes the choice to stage a replacement with two other children, rather than to lose the article that he knows could make his reputation as a journalist. However, when the story lead to unexpected consequences Ellis feels he must put things even if it means losing his job. Inspired by the actual infamous picture of a mother trying to sell her children during the great depression, Sold on Monday depicts that time and circumstance as well as explores and poses some different ideas about the family and the children on that picture in a fictional setting. In Sold on Monday, Ellis Read is the newspaper reporter who struggles to make it big and get ahead of the competitio Inspired by the actual infamous picture of a mother trying to sell her children during the great depression, Sold on Monday depicts that time and circumstance as well as explores and poses some different ideas about the family and the children on that picture in a fictional setting. In Sold on Monday, Ellis Read is the newspaper reporter who struggles to make it big and get ahead of the competition. Barely scraping by, he takes a similar picture (to the actual picture) of a mother and her two children to gain the sympathy and popularity. The article actually turns out to be a hit and makes it around to all the other newspapers. This may finally be the break he was looking for. But does he have regrets or feel ashamed of exploiting the poor mother and children? When he returns to check on the family, he finds out the terrible truth of the mother and begins to research the children’s whereabouts. Lillian Palmer is a secretary and new single mother at the same newspaper. She happens to be the one who develops the photo for Ellis. Hoping for a break and working hard to support herself and her child, she is interested to find out more about the situation of the photo. As their paths take them onto different directions, towards the end of the novel, they end up devising a plan to work together to solve the mystery of the family in the photo. Nicely written with the old style NY City feel, as you read this story you’ll hear the typewriters going and imagine the hustle and bustle of the editors, grumpy bosses, delivery boys, busy streets etc. Atmospherically set, I envisioned the plot unfold in sepia tones like an old movie. It reads well, addresses issues of its time and the characters are well developed. A moving read with a twist, inspired by a real published picture. I certainly enjoyed following Lilly and Ellis in their steps to find the answers. 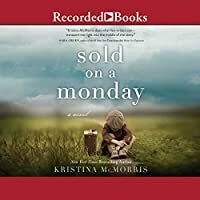 Sold on a Monday by Kristina McMorris is a historical fiction read in which the idea came about from a real photograph the author found advertising children for sale. The ideas are all fictional within the book though with even moving the time frame to that of the great depression. I’m not one that reads a ton of historical fiction but the cover and title of this book certainly calls out to readers even at a glance. Without even opening the book it would be hard to not feel the emotion simply com Sold on a Monday by Kristina McMorris is a historical fiction read in which the idea came about from a real photograph the author found advertising children for sale. The ideas are all fictional within the book though with even moving the time frame to that of the great depression. I’m not one that reads a ton of historical fiction but the cover and title of this book certainly calls out to readers even at a glance. Without even opening the book it would be hard to not feel the emotion simply coming from the cover itself when it comes to trying to fathom any reason a parent could want to sell their child. The book follows Ellis Reed, a reporter that happened upon the children and took a photo of them and the sign advertising their sale while looking for inspiration. And then there is Lillian Palmer who worked at the paper and saw Ellis’ photo and couldn’t help but want to know more. As Ellis’ story hits the papers the book then follows the characters from there but the children are never forgotten from that moment. Kristina McMorris did a wonderful job taking readers back into history painting a vivid picture of the time period. I did find myself getting a little concerned when the story seemed to move completely away from the children for a little bit in the book and wondered where it was headed. However, the author brought it back around with a lot of character growth and then diving even deeper into the emotional pool and tugging at the heartstrings showing the struggles of the era quite well. Definitely one I’d recommend checking out for the historical fans. It is 1931, and Ellis Reed, a reporter is searching for a story. In a photograph of children, standing on their front porch, he finds one. The sign beside them reads: “2 Children For Sale.” Ellis’ big break comes from writing a feature story about the photo, and when he goes back to interview the family, he discovers that they are gone. Ellis however, well, he needs that story - and so he stages one, almost an exact replica, of other children - and his career takes off from there and no one's the wiser or so he thinks. Lilly Palmer is an administrative assistant at the newspaper, who got Ellis his big story. As it turns out she discovers Ellis’ secret, which has major ramifications. Lilly knows she shouldn’t get involved but she just can’t help herself and soon she and Ellis are in serious trouble. “Sold on a Monday” was a quick, easy read. Though I enjoyed it, I was disappointed with where the storyline went almost from the beginning as the book wasn’t what I thought it would be, based on the synopsis. The characters of Ellis and Lilly were well developed however and drew me into their story as it was written. Published on NetGalley and Goodreads on 9.2.18. The picture and its accompanying story were shown all across the countryside. Ellis found himself in demand; all the while the tinge of guilt tugged at his mind. And Lily felt the same dilemma – what could they do about what they had released that day? The trauma and tragedy – and at the centre, two small children; confused and saddened. Sold on a Monday by Kristina McMorris is a tragic tale prompted by an actual photograph in a newspaper of four young siblings huddled on the steps of an apartment building in Chicago in 1948. “4 children for sale, inquire within”. The Author’s Note at the end of the book is interesting, but shouldn’t be read prior to the novel, as there are spoilers included. The gut-wrenching decision when a parent is faced with no food on the table is unimaginable. Completely heartbreaking. My only issue was, during the first third of the novel – after the picture - I almost put it aside, as it was nothing like what I had expected the story to be; I was becoming bored. But then the story ramped up and became the intense, intriguing, heartbreaking novel I expected it to be! Recommended. With thanks to NetGalley and the publisher for my digital ARC in exchange for my honest review. A thought-provoking and emotional profound historical fiction novel about a photograph of two children for sale. It all started when Ellis Reed spotted two blond-headed, scraggly young boys, pitching pebbles at a tin can, wearing nothing but patched overalls in front of a gray weathered farmhouse. When he raised his camera to take a shot he noticed the raw wooded sign: “2 children for sale.” Surprised and shocked, Ellis snaps a picture of the boys and that sign. Times were tough for everyo A thought-provoking and emotional profound historical fiction novel about a photograph of two children for sale. It all started when Ellis Reed spotted two blond-headed, scraggly young boys, pitching pebbles at a tin can, wearing nothing but patched overalls in front of a gray weathered farmhouse. When he raised his camera to take a shot he noticed the raw wooded sign: “2 children for sale.” Surprised and shocked, Ellis snaps a picture of the boys and that sign. Times were tough for everyone in 1931, banks were in crisis and breadlines were prevalent. But what could possibly pushed a family this most heartbreaking decision? Ellis never meant for the photograph to be published. But when Ellis’s editor at the Philadelphia Examiner saw the photograph, he wanted Ellis to write a feature article about the family. This might just be Ellis’s big break. The consequences of the photograph’s publication was more devastating than anyone could imagine. Lily Palmer, the editor’s secretary is despondent over the role she played in all that happened. She and Ellis attempt to make things right for this family before it’s to late. Within the first few pages of SOLD ON A MONDAY we are totally immersed in the feel of the times and of the place. The writing is beautifully descriptive and emotionally provocative. The heartbreaking photograph evokes painful memories for both Lily and Ellis, ultimately motivating them to action at any cost. The brilliantly plotted story takes us on a wild ride from that front porch, to the hectic city newsroom, to a dilapidated boarding house, a swanky dinner club, an encounter with the mob, the home of a rich banker, a warehouse break in, and a barn in the middle of sprawling fields. It’s a fast paced novel rich with suspense and full of well-defined characters. Ellis’s struggles with his decisions, his career, and his father were readily apparent and made him seem vulnerable and real. Lily, my favorite character was smart and diligent, and knew she could do so much more than be a secretary. Her strength, persistence and bravery in the quest to make things right is what makes this book come alive. 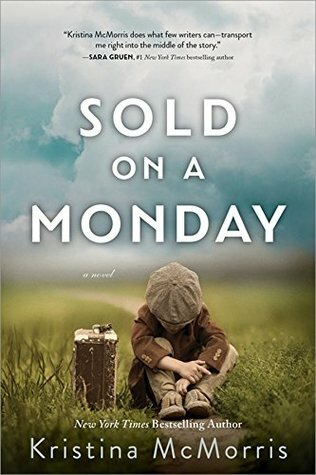 SOLD ON A MONDAY is a soulful blending of setting, story and characters. This book was inspired by an actual newspaper photo that stunned the nation in 1948. This story reminds us that each of our perceptions are unique and to question what we think we see. None of us can know the true story behind a photograph that merely reflects a moment in time. KRISTINA McMORRIS is a NYT and USA Today bestselling author. She lives in the Pacific Northwest and has written four other novels. Her novels have won over two dozen literary awards and nominations. Thanks to Netgalley for an advance reading copy of this book in exchange for an honest review. This appears to be my year for trusting my gut instinct and grabbing books based on the cover and title. I've been rewarded with some awesome books by doing so, and once again struck gold when I decided to take a chance and request an arc of Sold On A Monday. If the heart-touching cover photograph doesn't get you, the title, synopsis, and story will. This has also been the year for me to become a fan of fictional renderings of real life events. The story behind Sold On A Monday is based on a new This appears to be my year for trusting my gut instinct and grabbing books based on the cover and title. I've been rewarded with some awesome books by doing so, and once again struck gold when I decided to take a chance and request an arc of Sold On A Monday. If the heart-touching cover photograph doesn't get you, the title, synopsis, and story will. This has also been the year for me to become a fan of fictional renderings of real life events. The story behind Sold On A Monday is based on a newspaper photo (shown in back of the book) that shocked the world during the Great Depression. During this bleak time in history, families were faced with impossible, heartbreaking decisions. Banks collapsed, homes were repossessed, people were out of work, and families were starving. All hopes and dreams were shattered. And so, a heartbreaking photograph served as a sign of the times: 2 Children For Sale. Says it all, doesn't it? Ellis Reed was a struggling reporter assigned to cover the social circuit in 1931. In the execution of his duties, he stumbled across an old, desolated farmhouse and took a photograph of two little children sitting on the front porch. Not intended for publication, Ellis only takes one picture which will later prove paramount in upcoming events. Upon reviewing the photograph, he's stunned to see the sign that says 2 Children For Sale propped up near the boys. Do these children have any idea what the sign says . . . or means? Newspaper secretary Lillian Palmer later discovers Reed's photograph in the darkroom and is so moved by it that she passes it on to the powers that be. Through happenstance, Ellis is faced with some hard choices including one borderline unethical decision that not only changed the course of his life, but also utterly destroyed some innocent lives. Will Ellis and Lillian ever find a way to right this wrong? Sold On A Monday is a story first revealed through the lens of a camera - a moment of utter hopelessness forever frozen in time. But, thankfully, it's also a story of compassion, ambition, forgiveness, and redemption - a story of two people's determination to do the right thing with no thought of personal consequences. The setting and plot line drew me right into the story, allowing me to see, feel, even smell the agony, defeat, and heartbreak of families fighting for survival. I appreciated the direction and approach the author chose to tell this story as I think it broadens the reader's focus from the one photograph and allows them the vision to see a much bigger picture and story. I found the story pacing to be perfect as it kept me turning pages while searching for any assurance that it wasn't too late to set things right again. I highly recommend you skip all reviews and dive into this book prepared to not only be deeply moved, but also a little surprised. McMorris has written a stunning story - one in which a photograph is worth more than a thousand words. And yet, her words and rendering of this story are absolutely perfect! A 2018 Favorite! A Must Read! *I'd like to thank publisher Sourcebook Landmark for offering me an arc of this book via Netgally & Edelweiss+. Thanks to NetGalley and the publisher for a free, electronic ARC of this novel received in exchange for an honest review. When struggling journalist Ellis Reed sees two children at the side of the road wearing a sign stating simply CHILDREN FOR SALE he is immediately captivated by the children’s story. Soon he is photographing them and the picture quickly becomes front page news in every paper. Ellis is quickly drawn into a world of backdoor adoptions, mob Mafioso’s and parental desperation a Thanks to NetGalley and the publisher for a free, electronic ARC of this novel received in exchange for an honest review. When struggling journalist Ellis Reed sees two children at the side of the road wearing a sign stating simply CHILDREN FOR SALE he is immediately captivated by the children’s story. Soon he is photographing them and the picture quickly becomes front page news in every paper. Ellis is quickly drawn into a world of backdoor adoptions, mob Mafioso’s and parental desperation and when his journalistic integrity is on the line, Ellis must decide what secrets are worth keeping. When fellow reporter Lillian sees the photo of the children, she instantly immerses herself into the research as well, determined to find out what happened to the “children for sale” while dealing with her own secrets and demons. This story was based on an actual photo, which adds to the story’s credibility. Not only does this story tell of the desperation felt by families the world over during the Great Depression, but it also delves into the inner workings of the world of journalism in the same era (which I, personally, found very interesting.) “Sold on a Monday” by Kristina McMorris is definitely unlike any story I have read before. Deemed a historical fiction novel (and appropriately so) this novel is creative, with an inventive storyline, powerful characters and features both the dark and light sides of humanity. Ellis is a clumsy young man starting out, determined to follow his dream despite his father’s protestations and Lily is a career-oriented young journalist who is trying to make it on her own in a man’s world (at a pretty heavy cost) . This novel would not be nearly as enjoyable if did not have such a sweet and just ending. “Sold on a Monday” is powerful, moving and highly entertaining. It is definitely one not to be missed. A thoroughly inventive novel, it will draw you in from the first page and will not let you go until the very last sentence. McMorris’ novel is definitely something I would recommend to anyone looking for something more substantial than a beachy, summer read (without the pretention). They say that a picture is worth a thousand words and for Kristina McMorris this certainly holds true. Inspired by a poignant, tragic photo, the author has written a heart-wrenching tale about a reporter who snaps a photo much like the one that inspired McMorris which ultimately will alter the lives of the family in the photograph and many others as well. Sold on a Monday is a historical fiction book based on the They say that a picture is worth a thousand words and for Kristina McMorris this certainly holds true. Inspired by a poignant, tragic photo, the author has written a heart-wrenching tale about a reporter who snaps a photo much like the one that inspired McMorris which ultimately will alter the lives of the family in the photograph and many others as well. Sold on a Monday is a historical fiction book based on the a very real photograph. The story is set against the backdrop of the Great American Depression, an era that many Americans have chosen to forget. In creating this tale, McMorris brings the horror, pain and suffering of that time back to life again and in such beautifully written prose that it will carve this moment in time forever in your memory. This is exactly the type of historical fiction that I enjoy - it's fiction, yes, but there is so much truth, research and heart-wrenching details that the story comes to life before your eyes. In Sold on a Monday, McMorris tells the story primarily from the view point of two newspaper workers, one a reporter, the other is a woman who desperately wants to become one. Their lives intertwine over the photograph of two children who were for sale, a last act of depression that often occurred during the depression. As we learn more about this pair, their own personal histories, as well as what ultimately happens to the children, we discover the heartbreak, shame, the struggle of every day life during The Depression and the pain that everyone suffered just to survive. While Sold on a Monday is very heartfelt and at times it borders on despair, McMorris does not give us a maudlin book but rather one of courage, hope, love and friendship. In her own words, she gave the happy ending that she wished the children in the photograph could have had. I cannot recommend this book highly enough. Regardless of your typical genre themes, this is a book that will cross those barriers and grab you into its soul from the first page to the very last. Good and bad things seemed to happen on Mondays for Ellis Reed, but more bad. The day Ellis was biding time until a scheduled meeting, happened to be the day his career changed, but it also was the day that would change his life and the life of the Dillard family. Ellis’s story about a family who had their children for sale turned out to be something more than a story. It really happened, and when Ellis found out, he couldn’t stop thinking about it. Meanwhile Lily worked at the paper as a secretary and had a part in this story even though she didn’t write the story. Lily had a secret about the story and her personal life that she hoped would never be revealed, but you know how things work with secrets. Ellis wanted to be successful, but once he was, he still held back because he felt his success was based on the misfortunes of the family he had taken a photo of and had written a story about. Ellis and Lily worked together once they found out what happened to the Dillard’s after the publication of the story and the sign that said: 2 Children for Sale. They both felt responsible for the outcome, and it haunted both of them. Neither Lily or Ellis wanted to rest until they found out where the children were and what happened to their mother. Set during the depression, you can feel the troubles and worries families had and the desperate measures some of them took. SOLD ON A MONDAY has wonderful, lovable characters. Ms. McMorris marvelously portrayed characters you would want to know. You will be with them in their pain, their indecisions, their decisions, their love for each other, and their feelings. Ms. McMorris knows how to tell a story and keep you interested. SOLD ON A MONDAY is a beautiful story about caring and compassion. SOLD ON A MONDAY was heartwarming as well as heartbreaking. I loved this book and knowing that the idea for the book came from a picture of a pregnant mother and her 4 children, with a sign saying the children were for sale, is heartbreaking. The book starts during 1931 and the Great Depression, with a young journalist, Ellis, taking a picture of two boys, at a house with children "for sale" sign. Back at the office, secretary Lily, places that picture with other pictures, on her boss's desk, and Ellis is asked to write a story about the picture. When th I loved this book and knowing that the idea for the book came from a picture of a pregnant mother and her 4 children, with a sign saying the children were for sale, is heartbreaking. The book starts during 1931 and the Great Depression, with a young journalist, Ellis, taking a picture of two boys, at a house with children "for sale" sign. Back at the office, secretary Lily, places that picture with other pictures, on her boss's desk, and Ellis is asked to write a story about the picture. When the picture is ruined, Ellis heads back to the boys' house to take another picture of them and the sign, but the family has moved on. Ellis then goes across the street, with the sign, and takes a picture of a brother and sister, to recreate the original picture. The story and picture go out and they draw lots of attention for Ellis and for the children in the picture. Little does Ellis know that his actions of 'faking' the original picture are going to wreak havoc on the life of that brother and sister. I liked the characters of Ellis and Lily, both flawed, both growing and both dealing with past and present actions. I even liked most of the minor characters, most of them just ordinary people, working hard for little money, knowing that there were hundreds of people waiting to take their jobs. I know this book could be too slow, too subtle for many readers, but I liked the way it moved slowly, the way the romance(s) was so subtle, with Lily knowing she couldn't make a mistake of any kind...romance could not be about love at this point in her life. I believe every reader agrees the cover of this book is very sad and devastating. That a parent or parents during extremely hard hard times would advertise and sell their beloved children for money. It is utter desperation at its worst. It all started with that picture, but turned into an entirely different story, only to completely come back around to those kids and their mother near the end. It was a slow beginning and not a whole lot of action or interest or excitement. I wasn’t sure if I wou I believe every reader agrees the cover of this book is very sad and devastating. That a parent or parents during extremely hard hard times would advertise and sell their beloved children for money. It is utter desperation at its worst. It was a slow beginning and not a whole lot of action or interest or excitement. I wasn’t sure if I would like where this was all going but kept on reading and got more invested in the story and it did pick up. I ended up liking all the characters and what they were all individually striving for. They all had their own unrealized hopes and dreams, and what started with that one picture, set off many circumstances that spiraled out of control. This cover picture burns a hole in your heart and will always be memorable to me . I can’t say the same for the actual storyline, thus my 3 star rating.